The French call them film maudit—those scabrous, maligned, or otherwise compromised movies that may as well have been cursed. To what ends has long been hard to say, with The Last Movie all but buried after its initial release. A long-overdue, and presumably long-in-the-making, restoration by Arbelos Films should cement its status as one of ’70s cinema’s true wild cards, a work of compacted beauty and corrosive angst. Those expecting a mess, something like the Easy Rider acid trip at feature length, may be surprised by the fierce lucidity with which Hopper deconstructs his own movie. So much so that the notoriety of the film’s production, while credible enough, begins to seem a smokescreen for an altogether more audacious proposition: using a major Hollywood production as a site of critique. While Hopper’s jagged cutting between scenes certainly extends to the audience the insecurity described by Carson, there is nevertheless a fairly legible plot to be gleaned from the wreckage. 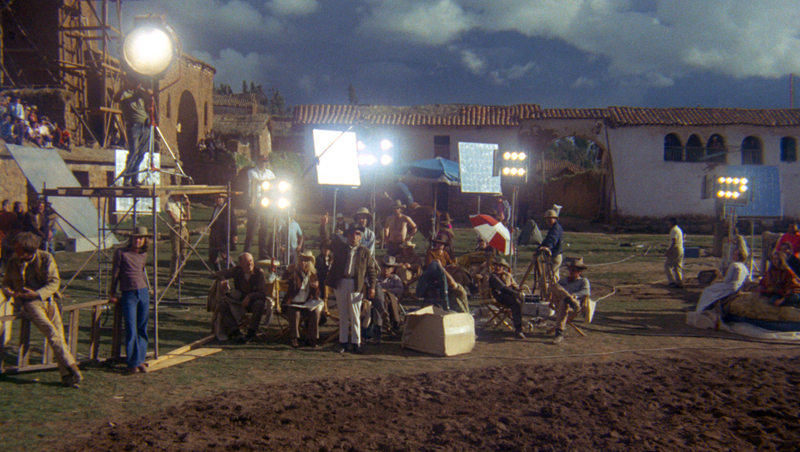 We open on a shootout reminiscent of The Wild Bunch (1969), only this version—quickly revealed as a movie-within-the-movie—is helmed by Sam Fuller rather than Peckinpah (Fuller reprises the cigar-chomping persona previously essayed in Jean Luc-Godard’s 1965 Pierrot le Fou, one of several points of contact with Godard in Hopper’s movie, most in screaming shades of red). Hopper’s cad becomes increasingly abusive as he takes up with several varietals of the ugly American, while the movie itself jettisons continuity to pursue the self-revealing logic of a fever dream, not so much breaking the fourth wall as dynamiting it. That thumbnail sketch only begins to suggest the film’s multileveled critique. For one, its cumulative burlesque of Hollywood’s cultural imperialism invites comparison with the likes of Godard and Santiago Álvarez, and the fact that a Universal production should be mentioned in the same breath as these radicals still boggles the mind. Each scene consumes what came before, with Hopper advancing the decidedly avant-garde agenda of using an essentially illusionistic medium to pierce illusions. A case could be made for seeing the resulting bonfire of vanities as a kind of performance art. Not only for the way that Hopper flings himself into the role—as ever, his acting doesn’t suggest a method to his madness so much as a madness to the Method—but because of the way the movie elevates risk to an operating principle, the better to exploit the weak spots of Hollywood’s dream machine. 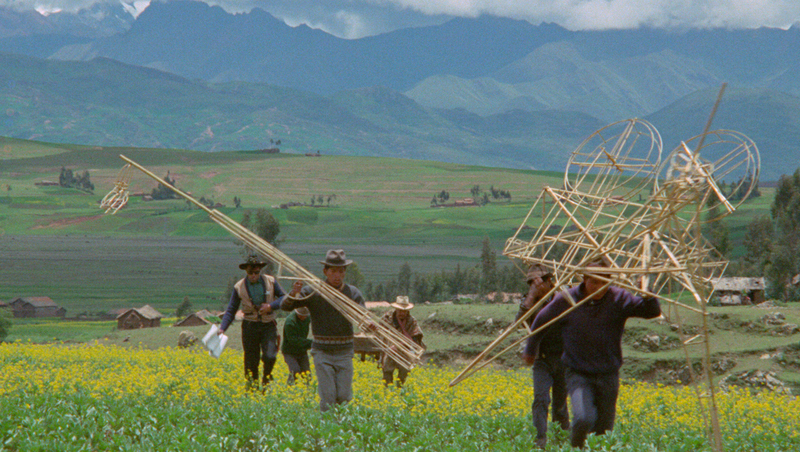 The one irreplaceable scene here shows the Peruvian villagers appropriating the tools of production, making their own movie on Fuller’s abandoned set. 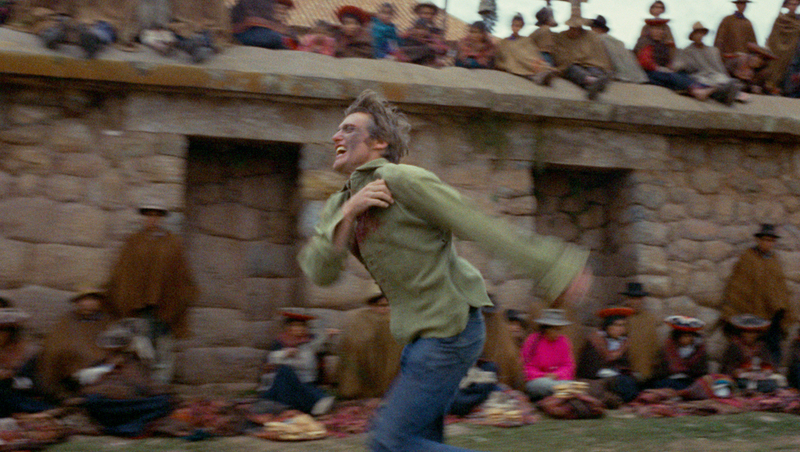 It’s cold outside—the restoration gives you the actors’ breath—but Kansas allows the anxious town priest to lead him down to the spectacle in the town square, where the villagers use torches for lighting and wooden approximations of filmmaking equipment (shades of Kidlat Tahimik’s 1977 wonder, Perfumed Nightmare). Kansas gently chides the novice director for having his actors actually duke it out and proceeds to show the actors how to throw a “real” Hollywood punch. Of course the real Hollywood crew has not, in fact, abandoned the set, as Hopper’s reflexive montage is at pains to remind us, and yet this scene is remarkably attuned to the postcolonial analysis driving what was then being called, hopefully, “third cinema.” Not the least of The Last Movie’s paradoxes is that a work so manifestly taken up with exhaustion should also be so adamant in its implicit demand for a new cinema. 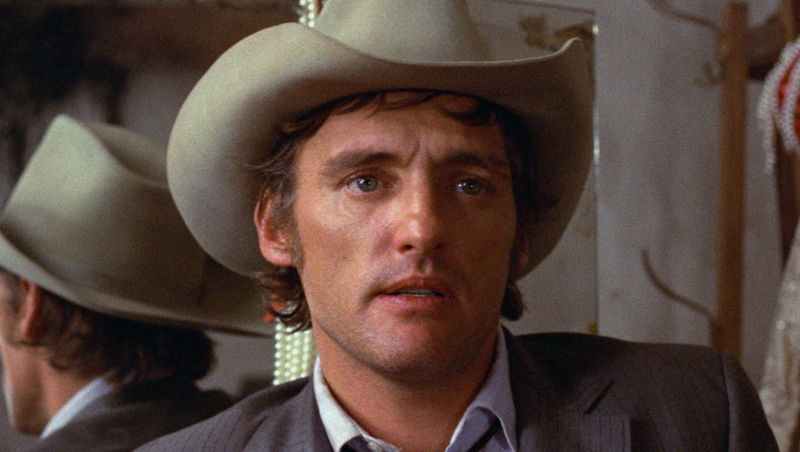 More particularly, Hopper’s mad movie judges the redemptive logic of the Western to be beyond redemption (as distinct from many of the so-called revisionist westerns of the same era, which either flip the script on the genre or accentuate its violence). 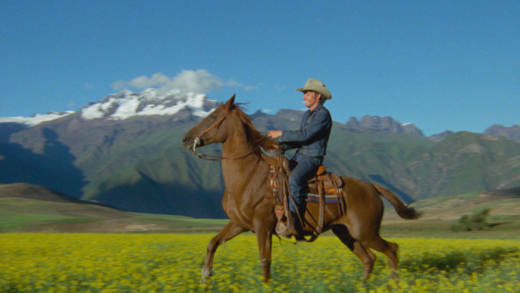 In this, The Last Movie resonates with the subsequent work of many visual artists and avant-garde filmmakers who would take up Western iconography as a way of grappling with this country’s interlocking mythologies of landscape, masculinity and violence. But then, this wouldn’t be Hopper’s last movie. It would take ten years, but the equally raucous Out of the Blue (1980) picked up right where Hopper was always leaving off—by the skin of his teeth. 'The Last Movie' plays the Alamo Drafthouse in San Francisco Sept. 7–12. Details and times here.